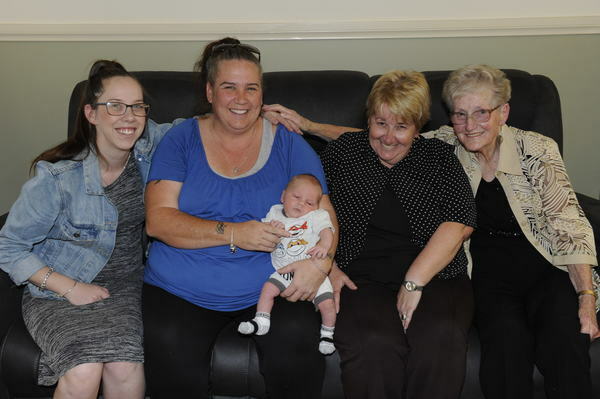 Janet Chadwick of Pakenham has welcomed her first great great grandchild, enriching her family with five generations of members. The 62-year-old celebrated Easter with family for the first time after welcoming the eight pound-one newborn into their ranks. There are almost nine decades between four week old baby Bodhi Oldaker, who was born on the 20 March, and his great-great grandmother. The family gathering included Bodhi’s mum, Rhiannon Chadwick, 22, Bodhi’s grandmother, Racheal Chadwick, 39, his great grandmother Janet Chadwick, and his great-great-grandmother, Audrey Zabaneh, 87. Racheal Chadwick said the family was thrilled with their latest tiny tot. “I think it’s an amazing because people that I’ve been telling have said ‘It’s such a rare thing’,” she said. “He was due on 14 April so we weren’t expecting him to be here for Easter,” Ms Chadwick said. She added Bodhi had a little trouble feeding when he was born four weeks premature but was now doing well at home.